Caption slip reads: "Photographer: Wesselman. Date: 1953-04-10. Reporter: MacMillin. Assignment: Bar brawl in attempt holdup -- victims at Georgia Receiving Hospital. 14: Theodore Nowicki, the guy who started it all. 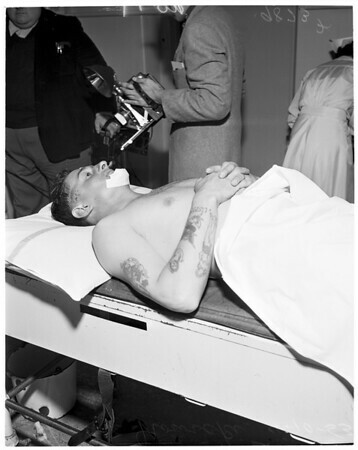 15: Ambulance attendant James T. Outlaw wheels Nowicki into hospital. 13: Jake Grizzell lights cigarette for his wife, Louise. 16: The Grizzells look over Nowicki in hospital."